#11-08 -- Fancy chalkholder cups for antique pool tables. One or more used on Brunswick and other tables to hold cubes of cue-tip chalk. Attaches to bottom of rail and folds out of sight when not in use. 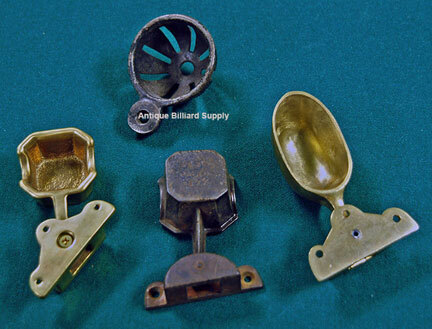 Available in antique iron (round shape shown at top or square shape with 1877 patent date shown at bottom) or in various styles of solid brass as shown at left and right.